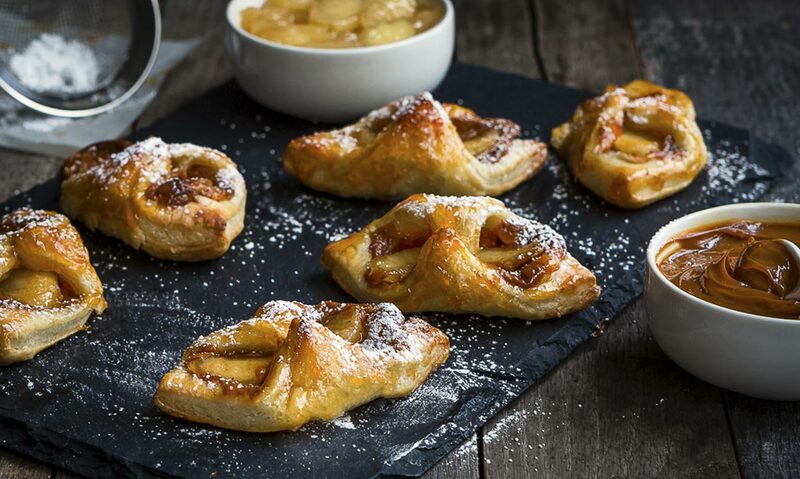 These Glazed Apple and Dulce de Leche Puff are crisp, buttery, flaky and totally indulgent! The fact that they are so easy to prepare makes them the perfect treat. Preheat oven to 400º F. Line a baking sheet with parchment paper. Unfold puff pastry sheet and roll to 9x12 inch rectangle. Cut twelve 3-inch squares. Spread each square with 1 teaspoon of dulce de leche. 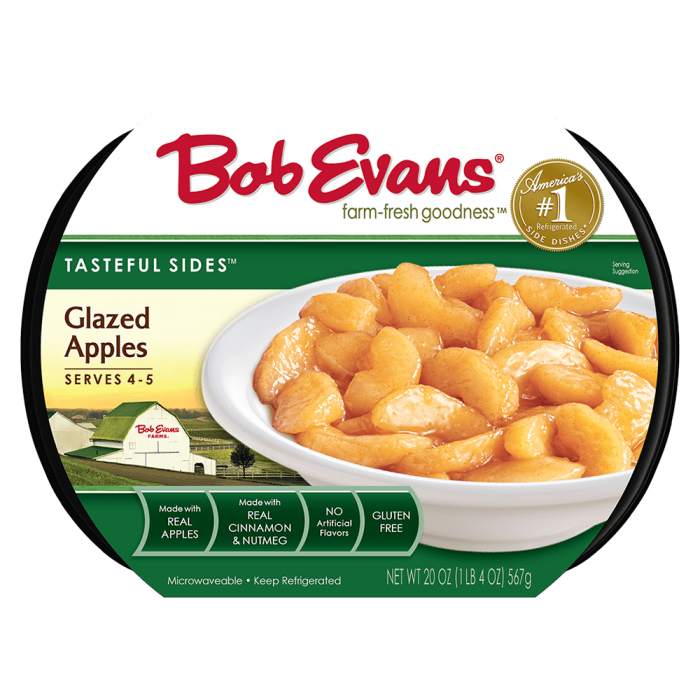 Place a Bob Evans glazed apple wedge diagonally on each. Fold 2 opposite corners to the center over the filling and press to seal. Place the filled pastries onto baking sheet. Brush with milk and sprinkle with sugar. Bake for 15 minutes, or until golden brown and puff. Warm the apple jelly in microwave for 30 – 40 sec. While the pastry is still warm, brush them with the liquid apple jelly, if desired. Cool on a wire rack. 1 Preheat oven to 400º F. Line a baking sheet with parchment paper. 2 Unfold puff pastry sheet and roll to 9x12 inch rectangle. Cut twelve 3-inch squares. 3 Spread each square with 1 teaspoon of dulce de leche. Place a Bob Evans glazed apple wedge diagonally on each. Fold 2 opposite corners to the center over the filling and press to seal. Place the filled pastries onto baking sheet. Brush with milk and sprinkle with sugar. 4 Bake for 15 minutes, or until golden brown and puff. 5 Warm the apple jelly in microwave for 30 – 40 sec. While the pastry is still warm, brush them with the liquid apple jelly, if desired. Cool on a wire rack.